Sometimes I just need a bright, sparkly color to start off my week. 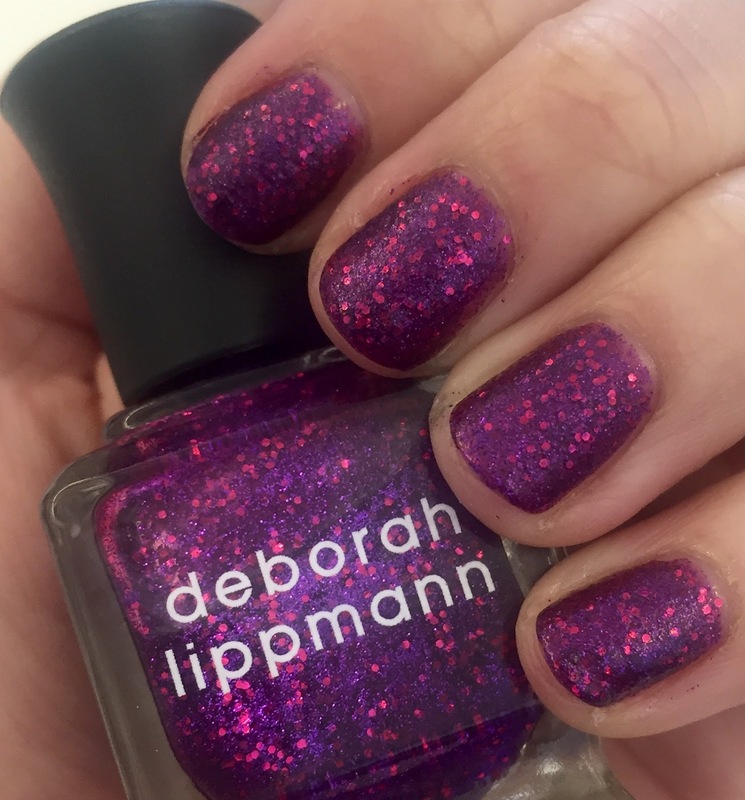 And let's be serious -- Deborah Lippmann Flash Dance definitely fits the bill. I purchased a few Deborah Lippmann polishes during her recent Friends & Family sale -- because they were only TEN DOLLARS EACH! I just couldn't pass them up. Flash Dance had been calling my name for, oh, YEARS. It was originally part of the Dance Music Mini Trio released exclusively for Nordstrom back in 2011. Yes, 2011. So it only took me four years to finally buy it. Shameful, I know. Flash Dance is, in a word, perfection. The magenta jelly base is liberally filled with multidimensional magenta and red glitter. The glitter creates a subtle holographic effect, which basically means I can't stop staring at my nails. One coat is fairly thin, so you'll need between two and three for full opacity. I went with two, mainly because I painted my nails before work this morning and I only had about 10 minutes before I had to walk out the door! I would possibly have gone with three just for more intensity, but two definitely does the job. It also dries to a semi-matte finish and is very textured, so I added a coat of CND Speedey Top Coat for a glossy finish. Deborah Lippmann polishes from left to right: I'm Not Edible, Glitter and Be Gay, Flash Dance. Deborah Lippmann Flash Dance retails for $20 at beauty.com. Oh, wow...I have never seen this color and now I want it! It's stunning! So pretty and it's great you got them for half price. I'm wearing a Lauren B polish in a gorgeous denim/teal. GORGEOUS!!!!!!!! I can't believe that you scored them for only $10.00 each! My nails are bare this week (for now anyway) because I haven't had the time to paint them... but dang... I love me some DL polishes and that purple one is gorgeous. What a deal you got there. I love how the glitter pops! So pretty. Love Deborah Lippmann! 10 dollars each is a STEAL! Love the purple/pink color combo!